I brought a few bags of soy curls back from America but hadn’t got round to using them. I decided to try them in a sort of BBQ application first as that seemed to be very popular. I made the chipotle sauce from American Vegan Kitchen which is used with portabellos in the book, and used it with soaked soy curls. I liked them fine but no better than the mushroom version, so I don’t think it was the right first choice. The texture was just a bit off. Since then, I’ve tried them in panini and liked them far better, but I’m still on the hunt for the very best way to use them. Please let me know if you’ve any favourites! 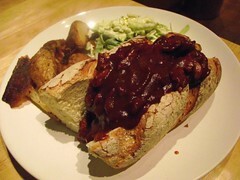 This entry was posted in American Vegan Kitchen by efcliz. Bookmark the permalink. The key to great Soy Curls is making sure you cook them until they’re really crispy. My husband, who is a HUUUGE carnivore, absolutely loves my Buffalo Soy Curls. First, I reconstitute them with just enough boiling water to cover. After five minutes and drain them (be sure to press/squeeze out as much excess water as possible). I season them and pan fry them (on medium heat) in just a touch of oil. During the pan-frying process, I press them down with a spatula and flip them until they are browned on all sides (as best as possible). After that, I place them in a single layer on a baking sheet and bake them at 425 degrees (Fahrenheit) for 5-10 minutes, until they have shrunken almost back to the size they were before they were re-hydrated. I just can’t get 100% behind soy curls. I’ll be watching your comments for tips. I love soy curls! My favorite use is in quesadillas. I soak the curls and then pan-fry them with mushrooms and a thin nutritional yeast sauce….cook it all down until the water cooks out and place the mixture in between a folded-over tortilla with more vegan cheeze….then heat the tortilla in a skillet on both sides and dip in salsa and vegan sour cream. They’re also lovely in tacos. I have bag in my pantry I’ve been waiting to use too. The quesedilla reply sounds interesting… Keep us posted on what you try! How different are soy curls to regula dried soy chunks or mince? Is it just a matter of different size and shape?? I use soycurls all the time. You can reconstitute them and drain them well, then fix them as a chicken salad with mayo, onion, sweet relish, celery, etc. You will need to add some seasoning, such as McKay’s (I have a homemade version.) They are marvelous in soups. They also soak up whatever you want to cook them in – such as a little water, Bragg’s/soy sauce, and seasonings (don’t rehydrate first.) You can also rehydrate and toss them with McKay’s and then pan fry them until they are browned and starting to crisp. Watch them, or they’ll burn. I’m finding all kinds of recipes online for them and can’t wait to try more.